The new year just sprung upon us. This is usually when I go through my bag and reorganize. I figured hey why not post what I carry. I know, it’s nothing new nor original. I’m surely not the first person to do this post. I always find it interesting though to see what others carry so maybe someone is interested in my daily carry. So, here we go. Lets start with the top left and move through from there. Seriously the coolest and most efficient screwdriver. Each turn and back cycle = 6 spins. Ever need to take notes about cables on a black network rack? So where does it all go? 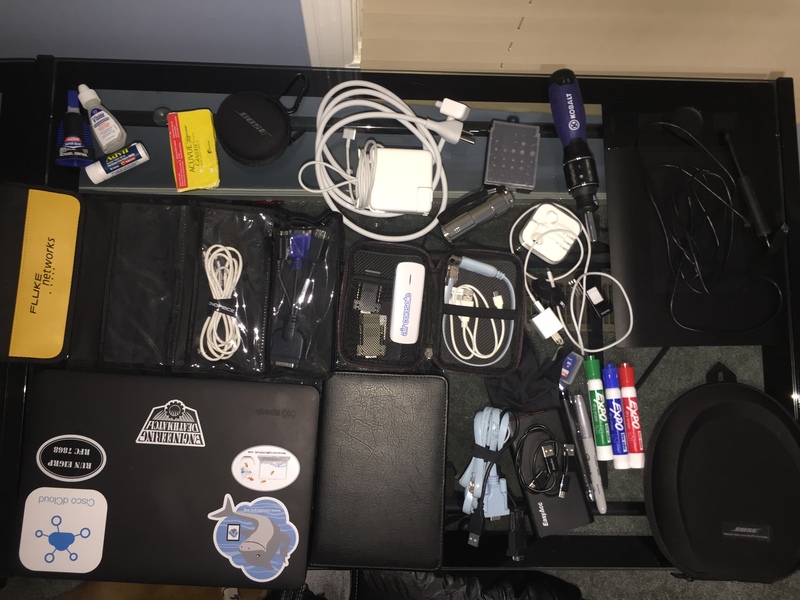 It seems like a lot listed out but to be honest it barely fills up the backpack I carry. I currently carry an OGIO Renegade RSS. Plenty of room for more than you need. Also, before anyone asks “what? No box cutter?!”. Daily carry is a Gerber Paraframe of sorts on my person.